On 21-22 September, the final trainings on the Regulation Brussels II bis took place in Vilnius, the capital of Lithuania. The event was held in National Courts Administration and was organized by the team of Law Institute of Lithuania. The topic of the trainings was “Jurisdiction in Matrimonial and Parental Responsibility Matters” and many issues of the proper application of the Regulation Brussels II bis were covered in that regard. The event started with greetings and presentation of the project. Dr. Jurgita Paužaitė-Kulvinskienė, Director of Law Institute of Lithuania welcomed the participants, while Dr. Antanas Jatkevičius, Advisor to the director of National Court Administration, expressed his support to the trainings and underlined that the topic of the trainings was very important for Lithuanian judges. Prof. Costanza Honorati, Project leader from University of Milano-Bicocca (Italy) presented the project, its results and the team. The first session was led by Prof. Vytautas Nekrošius and Dr. Kristina Pranevičienė from Law Institute of Lithuania. They gave a presentation on interaction of legal instruments: Brussels IIa Regulation, 1980 Hague Convention on International Child Abduction as well as 1996 Hague Convention on Parental Responsibility and Protection of Children. Then Prof. Carola Ricci, University of Pavia (Italy), held the session covering jurisdiction in matrimonial matters under the Brussels IIa Regulation. The next session which took place after the lunch break was covering jurisdiction in matrimonial and parental responsibility matters as well as lis pendens and dependent actions. Here the Croatian team – Prof. Ivana Kunda and Dr. Danijela Vrbljanac from University of Rijeka (Croatia) – took the floor. The first day ended with the session on hearing of the child. It was led by judge Dr. Karen Bilda from Regional Court of Hamburg (Germany) and judge Dr. Aistė Račkauskaitė-Burneikienė from Vilnius District Court (Lithuania). The second day of the trainings started with an important topic of prorogation of jurisdiction. Here the trainers were Dr. Maria Alvarez Torné and Dr. Georgina Garriga Suau from University of Barcelona (Spain). The trainings then ended with the session on transfer of proceedings. 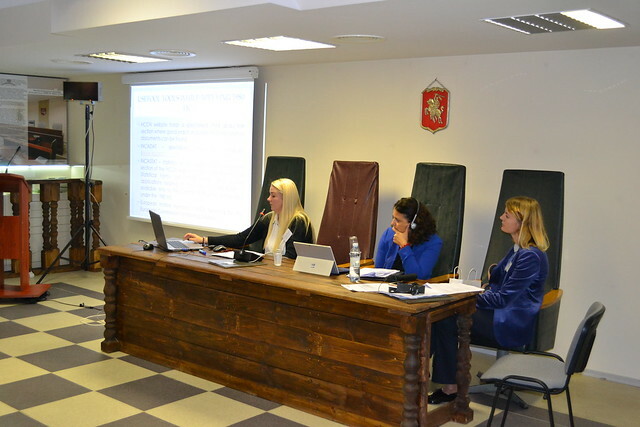 Prof. Costanza Honorati from University of Milano-Bicocca (Italy) gave a very interesting presentation of this complicated topic while Dr. Agnė Limantė from Law Institute of Lithuania discussed with the participants the case studies. There were so many judges and clerks interested in participating in the event that the registration was closed after one day – because the list was already full. The waiting list was kept and when couple of judges informed that they could not come, the open places were quickly filled in. In the end, over 70 participants were present in the trainings. During both days of the event lively discussions took place and people were keen on sharing their knowledge. Evaluation questionnaires, that were given to participants to fill confirmed that the event was indeed well organized and prepared. The overall evaluation was excellent and many times the judges confirmed the importance of the subject of the trainings. The trainings were organized implementing the project “EU Judiciary Training on Brussels IIa Regulation: from South to East”. The project is co-funded by the European Commission under the Justice program.